Former UCLA student Nancy Salas couldn't bear lying anymore to family about dropping out. (CNN) -- A young California woman who said she was abducted at knifepoint made up the story because she didn't want her parents to know she was no longer enrolled in college, authorities said. "It's kind of a tragedy," Sgt. Tom Lorenz of the Glendale Police Department said. "Here she was, the oldest daughter going to [the University of California, Los Angeles], and she was going to make it and be successful, and when she was no longer enrolled, she couldn't bear to tell anyone." The family of Nancy Salas, 22, reported her missing May 12, police said. According to investigators, her parents said Salas vanished during her morning job. A massive search was conducted, with law enforcement using bloodhounds and helicopters in the attempt to find her, Lorenz said. On Thursday, Salas was found in Merced, California, and told authorities she was kidnapped by a stranger, police said. 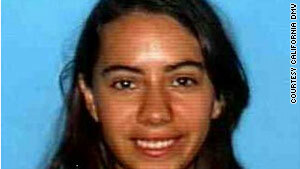 But detectives said her story began to unravel when they discovered she was not a student at UCLA. "Salas was a fourth-year student and sociology major who was last enrolled at UCLA in fall 2008," the school said in a statement. Salas was living a double life because she did not want to tell her parents she wasn't going to graduate, police said. "They were going to throw a big party for her," Lorenz said of the family in Glendale. "Frankly, she couldn't bear it anymore. She didn't know how to face them, tell them." "Everybody thought she was doing great and had high hopes for her and her future." Police informed Salas' friends and family of the truth, but at first they refused to accept it, Lorenz said. "At the very end, they truly believed that she was still a UCLA student," he said. "She really led a story here and a life. It was amazing. But it's all about the pressures of being successful and doing good for your parents." Efforts to reach the family for comment were unsuccessful. Lorenz said that an issue with her scholarship at UCLA prompted her decision to leave the school in 2008. The family has been reunited, and Salas will not face any charges from Glendale police, Lorenz said.